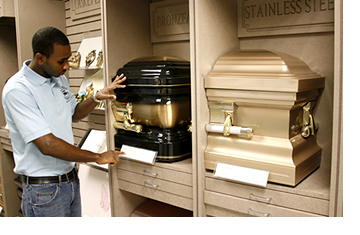 As one of the just over 50 programs accredited by the American Board of Funeral Service Education, Miami Dade College’s Funeral Service Education Program is committed to providing affordable, curriculum-rich, and ethical education to the public about Funeral Service. We are also regionally accredited by the Southern Association of Colleges and Schools (SACS). The Funeral Service Education Program began in 1964 on the North Campus and has trained many funeral directors and embalmers who continue to serve families in their local neighborhoods and nationwide. Our program is comprised of 72 semester hours of instruction, divided between courses in the Funeral Service Sciences and the Funeral Service Arts. One of the unique aspects of our program is that our students have the opportunity to gain “hands on” experience on campus in our Embalming and Restorative Arts labs. Additionally, students eligible for financial aid are able to use their funding to pay for their education. Feel free to contact us to tell you more about our Program, and answer any questions you may have. The Funeral Service Education degree program at Miami-Dade College is accredited by the American Board of Funeral Service Education (ABFSE), 992 Mantua Pike, Suite 108, Woodbury Heights, NJ 08097 (816) 233-3747. | www.abfse.org. View our brochure information. Fill out our graduate survey. Fill out our employer survey.